These trends will worsen as humanity dumps more carbon into the atmosphere. Like global warming’s effects on heat waves and vector-borne diseases, climate change’s consequences for pollen allergies reveal how greenhouse gas emissions are already damaging Americans’ health. To download data on the growing season for all 201 weather stations assessed, click here. Over the past few decades, the prevalence of allergies among Americans has skyrocketed. In 1970, about one in ten Americans suffered from hay fever, which is caused by airborne allergens, such as pollen and mold spores; by 2000, three in ten did. Asthma—which often occurs alongside pollen allergies—has become more common, too. The proportion of Americans who suffer from asthma rose from 3.1 percent to 8.4 percent of the population between 1980 and 2010. Rates are even higher among African-Americans, low-income households, and children. Today, some 6.2 million Americans under the age of 18 suffer from the chronic disease. These are expensive, dangerous problems. Overall, allergies cost the United States more than $18 billion per year. Asthma brought people to U.S. emergency rooms 1.7 million times in 2015; the next year, it killed about 3,500 Americans. And even the more manageable effects of pollen allergies remain inconvenient and uncomfortable. Researchers do not fully understand the causes of the upward trend in allergies. But one thing is clear: as humans warm the atmosphere, the freeze-free season generally begins earlier and lasts longer each year, extending the time during which plants can grow and produce pollen. Pollen allergies are caused by a variety of plants, which emit pollen at different points throughout the year depending on the species, local conditions, and other factors. Many trees start to send out pollen in the spring; grasses often peak during the summer; and weeds, such as ragweed, emit pollen into the fall. In this complicated mix, the length of the growing season—which lasts from the last freeze of the spring to the first freeze of the fall—can serve as a useful proxy. By examining how the length of the growing season changes, we can understand in general terms how plants are gaining time to flower and affect allergic Americans. To understand how the growing season has changed across the United States, Climate Central assessed temperature data for 201 cities. 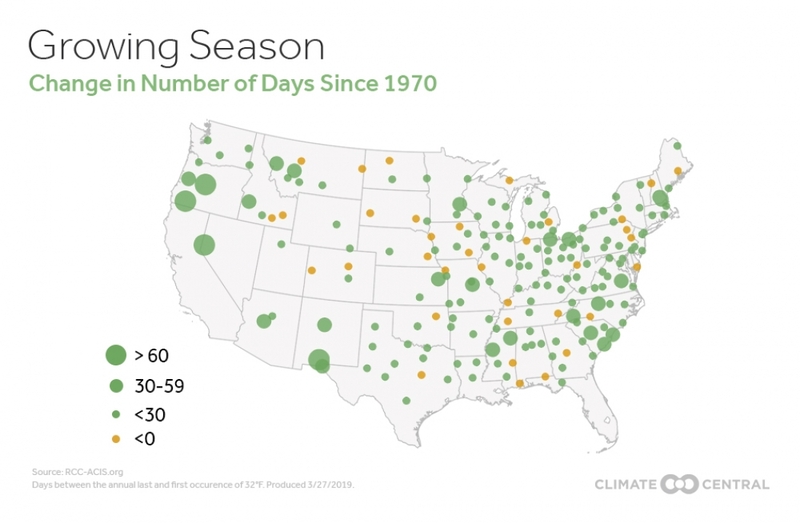 Of those cities, 83% saw their freeze-free seasons lengthen since 1970. In the average city, the amount of time between the last and first freeze of the year grew by just over two weeks. In 34 cities, including El Paso, Minneapolis, and Philadelphia, the season between first and last freeze grew by at least four weeks. In Bend, Oregon; Medford, Oregon; and Las Cruces, New Mexico, it lengthened by at least two months—among the biggest increases in the country. 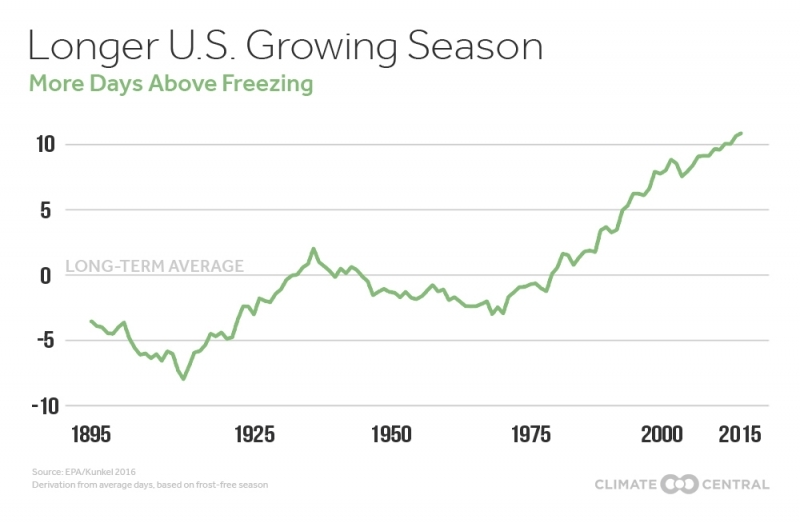 In general, relative to early twentieth-century averages, the freeze-free season has lengthened the most in the western United States, becoming about 19 days longer in the Southwest and 16 days longer in the Northwest. And as the frost-free season has lengthened, so has the pollen season of ragweed, one of the most commonly allergenic plants in the United States. In parts of the upper Midwest, for instance, the ragweed pollen season lengthened by about three weeks between 1995 and 2011. If warming emissions continue to climb unchecked, by the end of the century, the growing season will lengthen by at least an additional month in most of the United States, relative to late-twentieth century averages. And as the climate warms, plants can move into new areas, exposing people to allergenic pollen that they previously did not encounter. And that’s not all. In 2005, a group of researchers led by Lewis Ziska of the U.S. Department of Agriculture found that higher CO2 levels also increased the potency of ragweed pollen for allergic people. If CO2 concentrations reach 600 parts per million, ragweed pollen could become not just more common, but also about 1.7 times more allergenic than it was in 2000. Methodology: The first and last day below 32 degrees were retrieved from the Applied Climate Information System. The length of the freeze-free season is the number of days between these two points in time. Locations were only included in the analysis if they had a freeze season of at least 90 days.